Chandrashekhar Maharaj Saheb was born in Mumbai, February 5, 1933 in rich family of Ray bahadur Jivatlal Pratapsinh Radhanpurvala. Shri Chandrashekhar Vijayji Maharaj’s real name was Indravadan. His mother’s name was Subhadraben and father’s name was Kantilal.At the age of 18 in Samvat 2008 he took Diksha in Mumbai’s Bhaykhalla and became a jain monk. Maharaj Saheb’s sister is also Jain monk. Her name is Mahanandashriji. Shri Chandrashekhar Maharaj’s Guru was Shri Premsuri Maharaj saheb. Shri Chandrashekhar Vijayji gave diksha to 87 disciples. He had authored 275 books.He was strong believer in Indian culture and sanskar. He not just only criticized lord macaulay’s education system but was instrumental in creation of Tapovan vidyapeeths that offer alternative education. Thousands of children of Jains and non-Jains have received an education in Indian style in Tapovan vidyapeeths that are located in Navsari and in Amiyapur near Gandhinagar. Restless Maharaj Saheb once walked upto Vidarbh to save a Jain derasar there which was locked by the government due to dispute. Maharaj saheb stayed there in difficult circumstances but didn’t accept defeat. The moment Indravadan became Chandrashekhar vijayji maharaj saheb his entire existence changed drastically. He was counted as a dull student in school but immense Guru bhakti and dedication towards Pujya Premsuri Maharaj saheb gave him a new birth in Gnaan Praapti.For the fourteen years of Muni jivan, he never turned to see even his relatives or shraavaks. He was not only the favorite shishya of his Guruji but also was considered as the lifetime best student by the Kashi Vidyapith Nyaay Guruji. It was always a question for the people to judge that his efforts were more or his intelligence? While studying the most difficult Nyaay Granth, he used to write down so many books of homework.Swaadhyaay is said to be the heart of Saadhu Jivan and Pujya Guruma lived the life quite dominantly in this field. Raatri swaadhyaay wa one of the favorite activity of Pujya Prem suri maharaj and to please his Guru, he used to have 4 hours of Raatri swaadhyaay after pratikraman.Gurudev was King of knowledge as he was the owner of 20,000 shloks in his mind. He was also having amazing grip in Tatva Gnaan. His earlier books expose his exclusive depth of Shaastra Gnaan.He was having great nature of being Bold and revolutionary. Whenever he finds anything wrong, he used to oppose it with full force let it be outside or within himself. He was a great confessionary. He used to confess his smallest sins in front of thousands of people which truly require guts inside. Despite of being one of the great names in the history, he was so simple and down to earth personality that whenever he seats with children, no one can separate him from them. He was a forever child.Gurudev was guru of 84 shishyas but he never had a feel of that for a second in life. So many times he used to cry in front of his shishyas by saying that, “Tame moksh ma jaao tyaare aa paapi chandrashekhar ne tamara pag no angutho pakadva dejo! !”He was almost a perfect definition of an ideal Muni jivan. He never requires words to convince someone because his behavior was a mobile pravachan for the world. Panyaas shri Chandrashekhar Vijayji touched all the aspects of Jain shashan with utmost mastery.Samyag GnaanHe himself earned massive Gnaan, he taught people with the help of Tapovan and Sanskrit Pathshala. During eight days of Paryushan – a festival of Jains, all slaughter houses in Gujarat are closed. Shri Chandrashekhar Vijayji maharaj saheb was instrumental in convincing the government to do so.It is said that Karunaa is mother of all the Tirthankars and Guru Maa was undoubtedly the soul of an Arihant, so Karunaa in his heart was flowing 24×7 and 365 days a year.As we saw in the earlier sections of Guru Maa, he was quite curious and attached to the poor people even in his childhood. The habit drawn by his Mother, Subhadra Devi to feed a Chapatti to Dogs before having food had worked amazingly. Gurudev was full of Karunaa for the entire world. In the late 80’s when there was no rain for land and no grass for the animals in Gujarat, Gurudev took initiative and came to Mumbai. He kept the target of getting 2 Lakh rs. Per day and fulfilled all the requirements of Gaushalas of Gujraat quite successfully.Once he was in Tapovan and a Dog was crying in the late night. The very early morning he called upon all the trustees and cried in front of them by saying that “Chandra shekhar Vijay na jivan ma dhul padi..e ena jivan ma ek kutra ne pan radtaa atkaavi na shakyo! !” He cried in upashray for the entire night for offering condolence to that Dog. There are numerous examples like this.Before 16 years he announced open war against Chimanbhai Patel, the chief minister of Gujraat for the legislation for Gau Vansh ban in the state. After huge oppose and immense awareness in the people, the Chief Minister had to give up.Here is the statement of Chimanbhai Patel to the state, “ I am going to ban Gau Vansh Hatyaa from my state now onwards. I am aware that it will affect immensely to my Muslim Vote Bank but still Chandrashekhar Vijay Maharaj saheb and his huge caliber has left no option for me. He made the entire Government helpless against him. We are at knees to the strength of a Jain monk”! !Even when the BJP Government was in the rule, the Planning Commission planned to create 54,000 new slaughter houses all over India. When the ears of a Karunaa sagar Gurumaa heard it, he immediately announces that if the Government will accept these proposals, he will march towards Delhi and will take a Fire Bath in the streets of Chandni Chowk. His warning and Signature Campaign worked. By just one strong statement, this saint saved millions of animals. Even when Deonar was on the eve of modernization, Guru Maa came to Mumbai and asked Jains to come on the streets to stop this cruelty. Ultimately that proposal also went to the dustbin.The saga of Guru Maa’s Karunaa is endless. We can just say that it is great Karunaa of Lord Vardhmaan that we were able to see, hear and touch the Karunaa-full personality of the world, Guru Maa…. Chandrashekhar Maharaj had successfully motivated the movement to stall expansion of Mumbai’s Devnar slaughter house. Shri Chandrashekhar Vijayji strongly believed and also asked his followers to tell the government during census that Jains are Hindus. He said even if the minority status could bring in incentives from the government, it is not right for Jains to say that Jains are not Hindus. He preached that as Vishnavs are Vaishnavs because they follow Vishnu, the Jains are called Jains because they follow Jineshwar. But live Vaishnvars, Jains too are Hindus. Shri Chandrashekhar Vijayji maharaj saheb’s main contribution was to attach the Jain youths with Jain faith. He organized numerous youth camps and created channels through which youths came closer to their faith. He was instrumental in creation of Vir Sainik dal, Sanskruti rakshan dal and other small organizations working in this direction. It is said that Karunaa is mother of all the Tirthankars and Guru Maa was undoubtedly the soul of an Arihant, so Karunaa in his heart was flowing 24×7 and 365 days a year.As we saw in the earlier sections of Guru Maa, he was quite curious and attached to the poor people even in his childhood. The habit drawn by his Mother, Subhadra Devi to feed a Chapatti to Dogs before having food had worked amazingly. Gurudev was full of Karunaa for the entire world. In the late 80’s when there was no rain for land and no grass for the animals in Gujarat, Gurudev took initiative and came to Mumbai. He kept the target of getting 2 Lakh rs. Per day and fulfilled all the requirements of Gaushalas of Gujraat quite successfully.Once he was in Tapovan and a Dog was crying in the late night. The very early morning he called upon all the trustees and cried in front of them by saying that “Chandra shekhar Vijay na jivan ma dhul padi..e ena jivan ma ek kutra ne pan radtaa atkaavi na shakyo! !” He cried in upashray for the entire night for offering condolence to that Dog. There are numerous examples like this.Before 16 years he announced open war against Chimanbhai Patel, the chief minister of Gujraat for the legislation for Gau Vansh ban in the state. After huge oppose and immense awareness in the people, the Chief Minister had to give up.Here is the statement of Chimanbhai Patel to the state, “ I am going to ban Gau Vansh Hatyaa from my state now onwards. I am aware that it will affect immensely to my Muslim Vote Bank but still Chandrashekhar Vijay Maharaj saheb and his huge caliber has left no option for me. He made the entire Government helpless against him. We are at knees to the strength of a Jain monk”! !Even when the BJP Government was in the rule, the Planning Commission planned to create 54,000 new slaughter houses all over India. When the ears of a Karunaa saagar Gurumaa heard it, he immediately announces that if the Government will accept these proposals, he will march towards Delhi and will take a Fire Bath in the streets of Chandni Chowk. His warning and Signature Campaign worked. By just one strong statement, this saint saved millions of animals. Even when Deonaar was on the eve of modernization, Guru Maa came to Mumbai and asked Jains to come on the streets to stop this cruelty. Ultimately that proposal also went to the dustbin.The saga of Guru Maa’s Karunaa is endless. We can just say that it is great Karunaa of Lord Vardhmaan that we were able to see, hear and touch the Karunaa-full personality of the world, Guru Maa…. 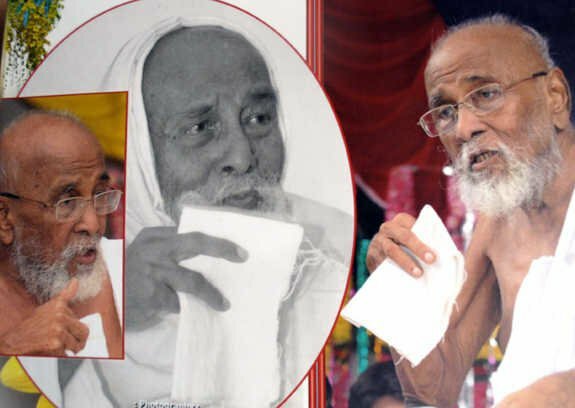 It was a sea of humanity that braved rain and wind to take part in the Palkhi yatra (final journey) of 78-year-old saint Chandrashekhar Vijayji Maharaj that culminated at Tapovan Sanskar Peeth in Amiyapur village in Gandhinagar on August 8,2011 where the saint was laid to rest. Maharaj Saheb's Palkhi yatra accompanied by thousands of devotees from Ambawadi travelled a distance of 25 kilometres before reaching Tapovan Sanskar Peeth at 5.30 pm. Countless people, including over 5,000 monks from across the country gathered to pay their last respects to the revered saint. I'm not addicted to twitter,+Umang and Facebook. I only tweet/posts when I have time: lunch time, break time, off time, this time,that time, any time, all the time. If you like this Blog,Please Plus it,Tweet it and Like it. such a great information on jain dharma and jain history, very interested to read more about jain religion.